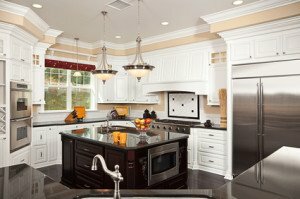 For most Myrtle Beach home owners the kitchen is the most important room in the house. It is the place where family gathers and guests are entertained. This means that remodeling the kitchen with the latest appliances and updated kitchen cabinets while sticking to a budget will require skill, experience and the help of a good kitchen remodeling company. The Myrtle Beach market is full of kitchen design professionals who bring their talents to the table. However, you need a kitchen remodeler who can listen to your dreams, lifestyle and budge and provide a solution that fits within your specific parameters. Keep this checklist in mind before contracting with a company to give that needed face lift to your kitchen area. Make it a point to check the credentials of the contractor before you sign the contract to renovate your kitchen. Do they have a license to perform the work in your area? Are they properly insured – both liability and workman’s compensation insurance? Ask if they use their own employees or subcontractors. If they are using subcontractors, insist they show you proof that the subcontractors are carrying the needed insurance. Ask for references. Then take the time to check those references. Ask if anything went wrong in the remodel process (because it usually does) and how the contractor handled the problem. Ask the references what they would do differently. Before you start the project you should have a time frame the project will be completed. Make sure you inform the contractor of any upcoming event at your home such as a wedding or holiday party. The kitchen remodel company needs to coordinate with other contractors such as plumbers and electricians as well as ordering new appliances, countertops and cabinets. You are more likely to have the project completed on time by making them aware of any pending deadlines. Upgrading your kitchen can improve the value of your home and you can often get a return on your investment when you sell your home. However, a kitchen remodel can be a large investment. A skilled kitchen remodel professional can make suggestions and bring great ideas to the table if they know your budget for the project. You should also discuss your cooking style, how often you entertain and lighting requirements. Be sure to ask about lighting and the ventilation of the kitchen area. Ask what will be needed with plumbing, adding more storage area, what appliances you prefer, updates to cabinets and hardware and any electrical changes for additional outlets or to accommodate additional amenities such as flat screen TVs or computers. A good kitchen remodeler will offer other ideas to improve the functionality of your kitchen space. This is your kitchen upgrade. Make sure you let your dreams, requirements and needs be known with the contractor. Don’t be afraid to repeat desires that are important to you to ensure that you are fully understood. What type of counter tops do you want? What will the flooring look like? How much working space to you need? What about storage? A good kitchen remodeler will have a variety of ideas that fit within your budget. Remodeling your kitchen should be a fun and exciting experience – if you have the right contractor for the job. Call us today for an in-depth consultation to discuss your specific kitchen remodel dream.